After working in the music industry for over 15 years I’ve learned the true value of “networking.” As a young adult early on in my career, like many youth out there I would meet various people that could “help” me in some sort of way whether it be an introduction to someone who could offer me an internship, an artist who I’d love to have on the radio show or promoter that I’d like to do a co-event with. Initially when I met them, I knew deep inside I wanted to help them as well but my choice of words or actions didn’t always communicate that. When speaking with these people I would quickly go over the various things I needed help with and at some times I could see them tuned out and the conversation would usually stop there. For those that were nice, they entertained the initial conversation only to go radio silent when it came to follow up. Luckily, one person that I met with was completely honest with me. At the time I mentioned how it would be great to promote my college radio show flyers at his professional training studio or announce the program in his class without offering anything in return for such a gesture such as a featured interview on the radio show or helping him market his training services. He said bluntly to me that day, “you don’t understand networking.” This puzzled me because I was involved with several networking organizations and my entire mission statement was centered around wanting to help people. After initial shock statement, I learned of what I was doing wrong and was glad that he took the time to explain his initial frustration that stemmed from others (mostly younger) also making the same mistake. I was giving the impression that all I cared about from the relationship was what I could personal gain, without giving much thought to what they had to personally gain from either helping me or a long term business and personal relationship. From that point on, I vowed to trust synchronicity and karma and help those that I believed in, first without expecting anything in return, especially those who were able to “pay it forward” in helping another person within my network. Those that didn’t offer the reciprocation of also helping someone else or myself were less likely to get a response after the initial non circular experience. This was an invaluable lesson to learn early on in my career because it made my job even that more fun or fulfilling. The challenging part is that I encountered many people who wanted to take advantage of the offer to help without ask for immediate reciprocation. People would call out of nowhere to ask for concert tickets, an introduction to an artist, or even a job or free consultation to help with their job and not realize how the ask was out of the ordinary. In those cases, a person could feel “used” even if you didn’t mean to make them feel that way. Without careful care, a great relationship could also turn quickly into a sour one with the wrong referral so be careful in who you share your relationships, advice and network with. You would hate to damage a good relationship with an introduction to someone you might not really know or haven’t personally experienced their services or as a co-worker. I share the link below not because I want to judge anyone on their current behavior but would love to help anyone that may not realize what they were doing as I was at one time. I decided to call my company the Third Floor Network, not only named after our original Third Floor Radio show, but to have the word “network” in the title describes what our team does, which is helping connect the dots with artists to brands to services to media companies to amplify discovery, collaboration or in best cases, monetization for everyone involved. I don’t work with people that have the mentality that are in it for the personal gain without wanting to also help others. Think about the people around you and your “network” – if they aren’t providing the reciprocal support that you are providing them, in the true definition of the word, they aren’t really apart of your “network.” When first meeting someone that you’d like to work with, think first of how you could help them and your personal gains second or not at all, in most cases if you offer a hand or an introduction, you’ll receive it back. In cases that you don’t, be the stronger person and walk away from the one sided relationship and trust that the universe will return the gesture in another way. With that being said, here is a great Washington Post article that I wish I had read at the start of my career. 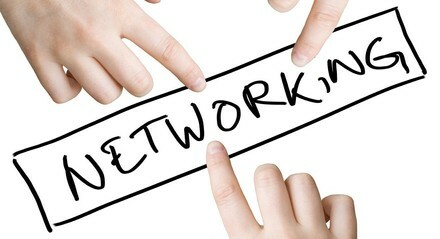 Career Coach: Keys To Networking Success via the Washington Post by Cynthia K. Stephens.